It was the end of June. Bangalore had been shockingly dry with no signs of rain. 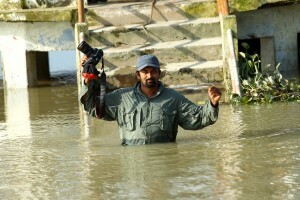 I got a call from my friends in Assam, salve saying that Kaziranga was in flood and I must come over to help document it. All night my equipment was readied for the trip (yes, decease it does take all night). Reached Guwahati by mid-afternoon and drove straight to Kaziranga. There was no rain, just a blazing hot sun and water everywhere. I cursed myself for bringing the sun with me from Bangalore. I was rain deprived and hoping to see some real monsoon. By around 10PM after six hours of driving, we were stopped by people along the road, saying that we would have to turn back, the river had engulfed the road. We pushed on forward and came to a traffic jam. Waters of the River Brahmaputra had indeed just started to submerge the road. While the big lorries moved on, although emanating large clouds of smoke from their vehicles, the little cars were hesitant. After another half hour of confusion the blockade cleared and we moved forward, tyres up to about a foot in water. We hurried along and reached the administrative boundaries of Kaziranga. The Forest Department guards had set up a check point. They handed us a ‘time-card’ and entered in a time and told us to drive slowly and carefully as wild animals were on the highway. The time-card was to ensure that vehicles moved at a slow speed. Check points ahead would calculate your speed of travel from point A to B, another way to deter people from speeding along the highway. All along there were animals, herds of Hog deer, Swamp deer, Wild Buffalo and a few isolated ones. The highway was their high ground, a temporary refuge before they crossed into the Karbi Hills on the southern side of Kaziranga. It was well past midnight by the time we reached the destination and unpacked. The next day started by 4AM. Packed and ready we were out of the door to see the extent of the flood, the damage, and how the animals were dealing with this. The day we arrived, the entire park was submerged. The road was just about manageable in some places. This image was taken closer to the last day when the waters had subsided considerably. Two days earlier this portion of the road was impassable. Floods are also a time of plenty. Young boys set up fishing nets at night and in the first light of dawn collect a variety of fish to sell on the highway and to consume at home. 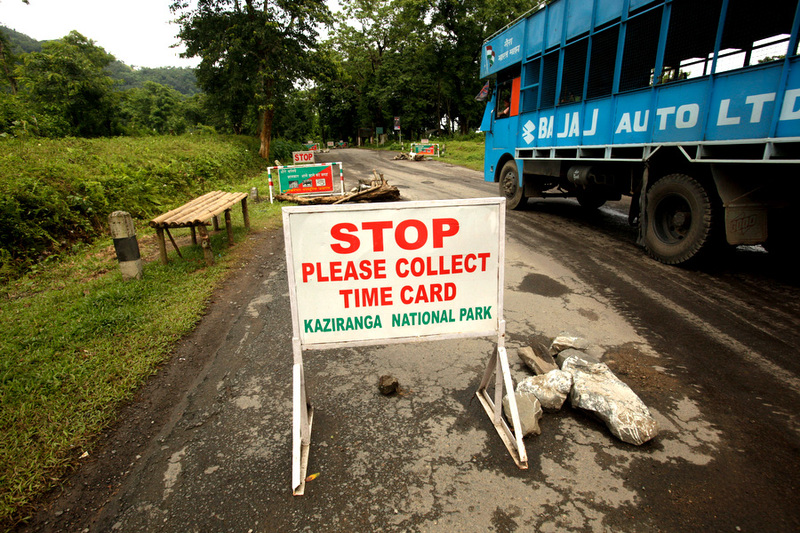 All along the National Highway-37, passing along the southern boundary of Kaziranga National Park, the Forest Department had set up blockades to control the speed of traffic. Time cards are also given all night to prevent motorists from speeding. 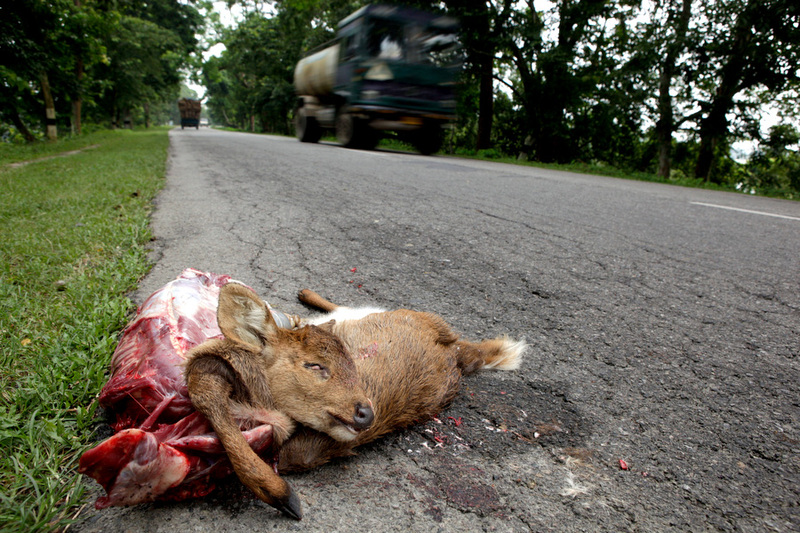 Yet many animals, especially Hog Deer die on the highway. The only proper solution would be to close the highway to night traffic. Many National Parks and protected areas across the country have successfully introduced a ban on night traffic. For Kaziranga this step is vital. 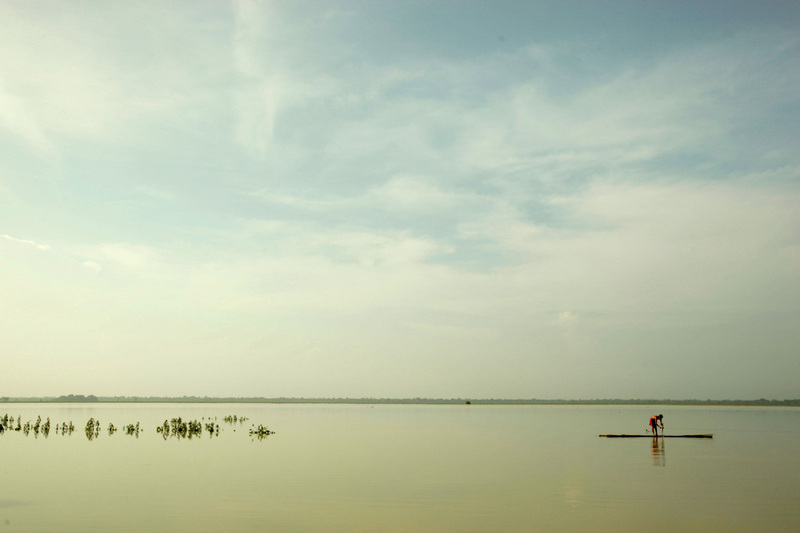 A boatman goes past houses fully submerged by the rising flood waters of the Brahmaputra and its tributaries. A rhino calf separated from its mother while escaping the flood lies stranded at the back of a house, ever hopeful that its mother will come back. Wildlife rescue teams at the Centre for Wildlife Rehabilitation and Conservation will again have their hands full with many species like this rhino abandoned and unable to cope on their own. A rhino in a pool of blood. 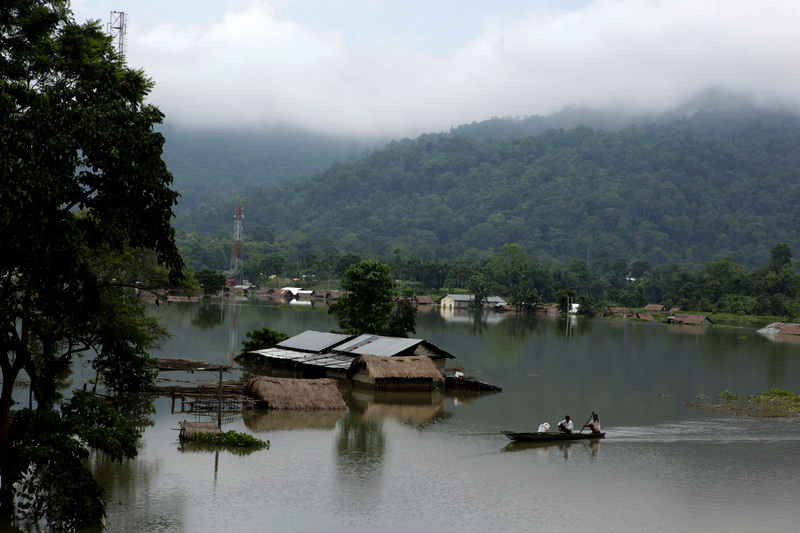 Rhinos escaping the rising flood-waters of the Brahmaputra seek shelter in the Karbi Hills to the south. 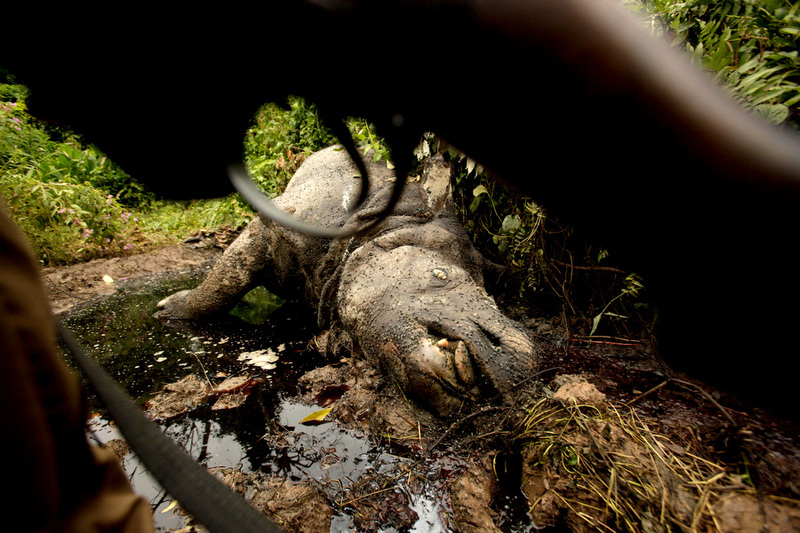 This is where the poachers lie in wait for an opportunity to strike. The Forest Department tries desperately to round up each rhino and send it back towards the mostly flooded park. While we were there four rhinos had been poached in different parts of the reserve. 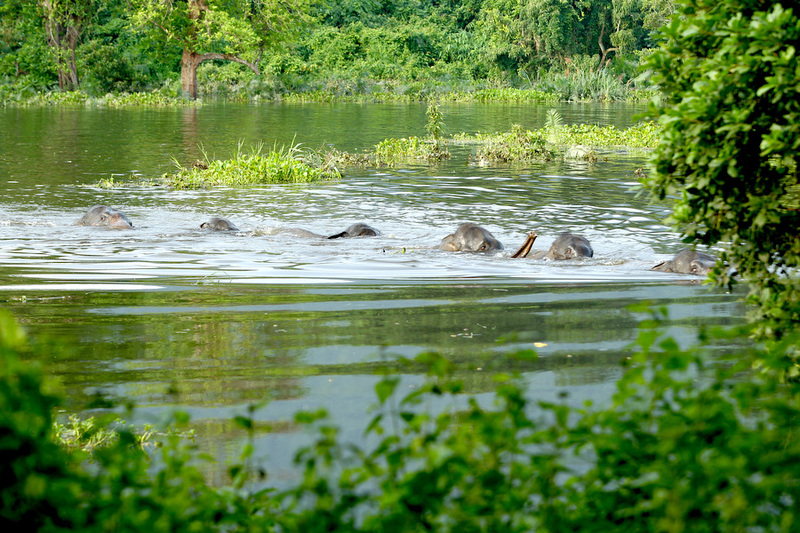 Elephants, great swimmers, also suffer greatly during the flood. Here a line of elephants using their trunks like snorkels follow each other, almost like a line of young shrew. Led by the matriarch they are heading to high ground. Interestingly this particular herd left the hills of Karbi and entered into the flooded plains of Kaziranga. 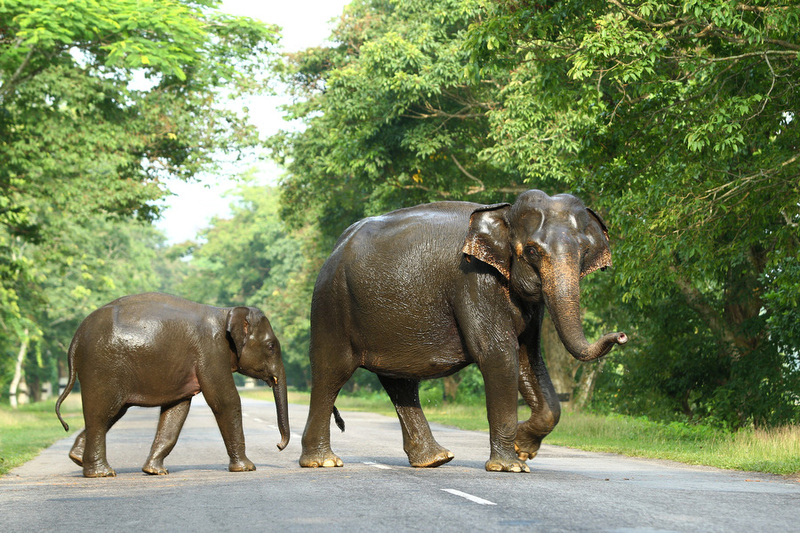 Fully soaked a herd of elephants cross the highway in the early hours of morning when the traffic is not too bad. Later in the day traffic on the highway causes a lot of stress to tired animals that jump back into the flood-waters unable to cross the highway due to constant traffic. The ones that can’t swim so well seek temporary refuge on mats of floating vegetation. Hog deer were among the most affected with the highest number of casualties. For anyone familiar with Kaziranga they may perhaps recognise the elephant riding point at Kohora. Two days earlier even the platform was under water. You can imagine how wide the Brahmaputra must have been for waters to be this high, submerging the entire region. 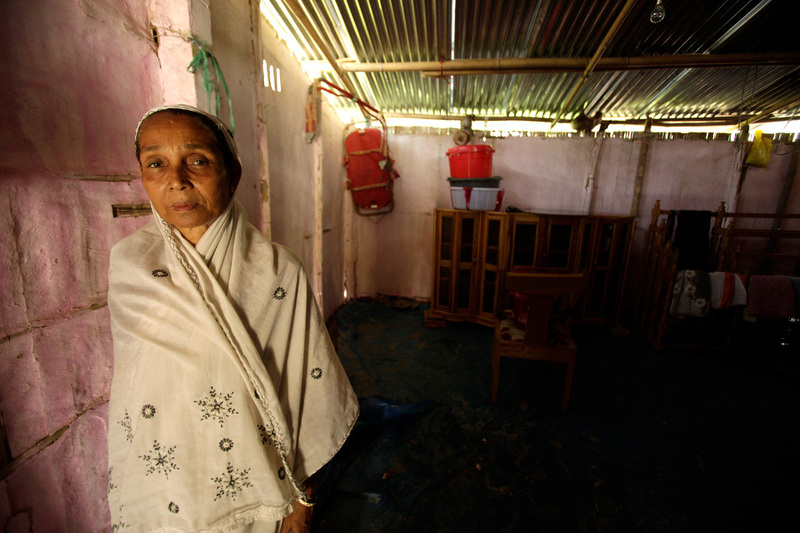 Flood waters inundate houses located several kilometers away from the Brahmaputra, such as this one on the banks of River Diphlu. All in sight becomes one vast sheet of water. 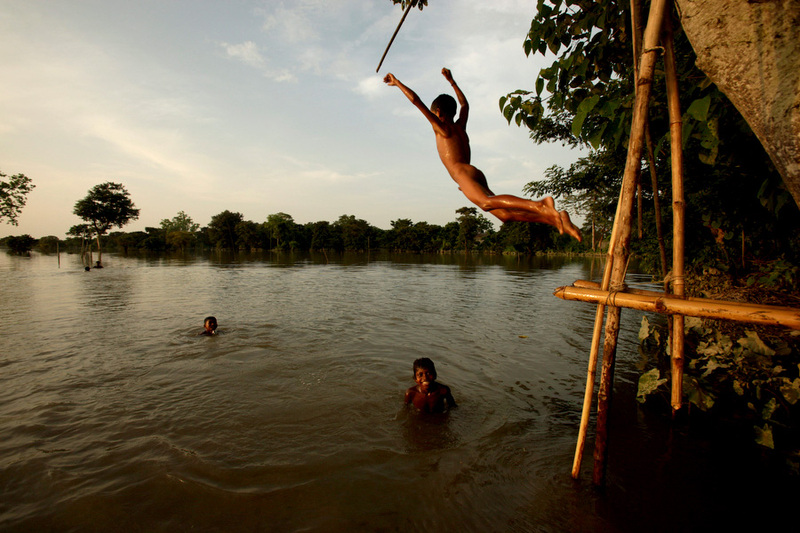 Backyards turned into a giant swimming pool, young boys enjoy the temporary flood waters. 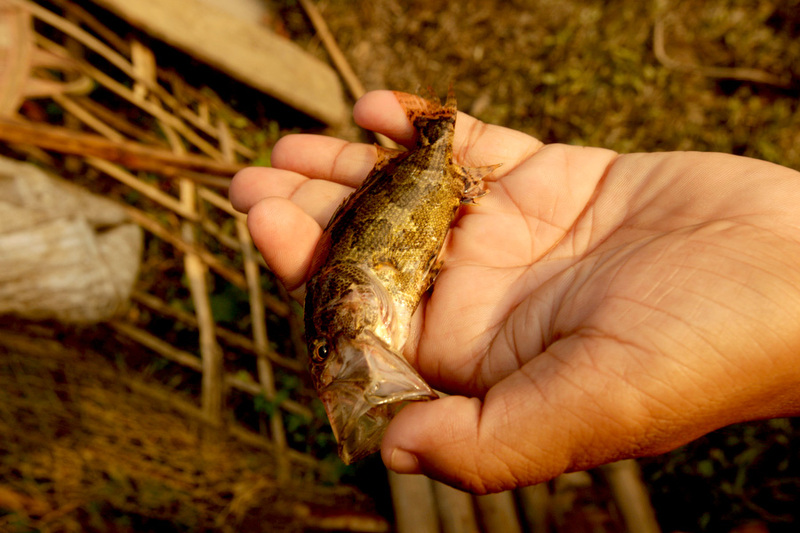 With an extraordinary gape the Nandus nandus, Gangetic Leaf Fish is one of numerous species of fish that inhabit the waters of the Brahmaputra. Everyone in Kaziranga knew or rather expected another BIG one to come again this year. The soil already saturated from the first flood would not be able to absorb any thing more. Sure enough, over the weekend (September 23rd 2012) Kaziranga flooded once again. 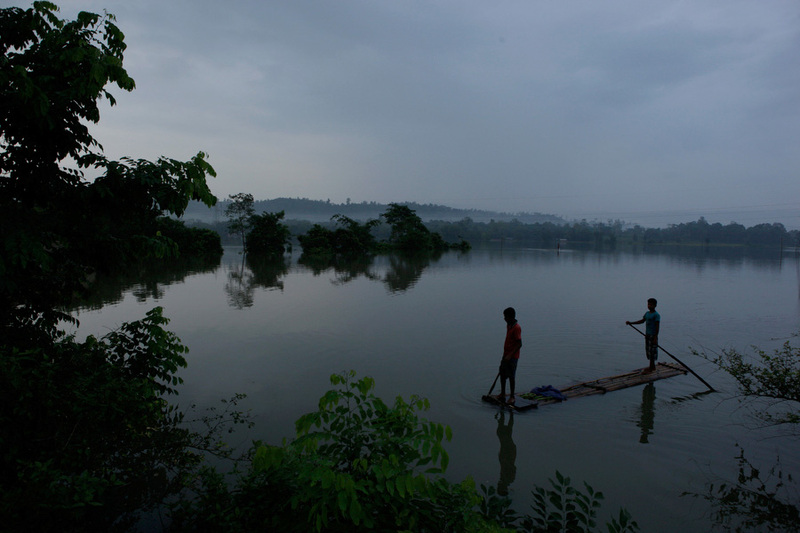 The waters have touched the highway and the rains in the catchment area of Arunachal haven’t stopped. Already hundreds of thousands of people have been displaced or affected by the flood. In the next few days we will find out the true extent of the flood and how many more animals have died in this year’s second big flood in Assam. 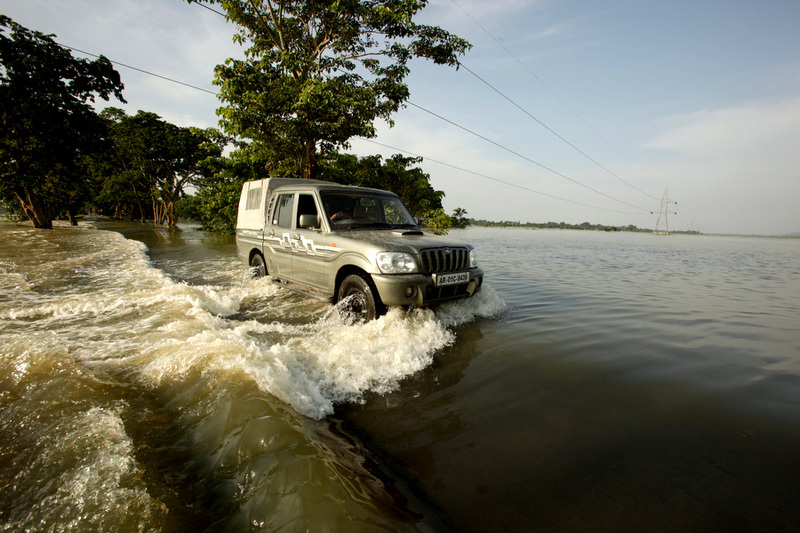 But for Kaziranga, floods like this are an important part of the natural cycle. The amount of top soil that gets deposited during the flood enriches the soil and ensures a lush growth of new vegetation to support new life. To really get an idea of what the area looks like, one has to see the Brahmaputra from above. In this parting shot, one can see the width of River Brahmaputra. At places the river can be over twenty kilometres wide, perhaps double that during the flood. 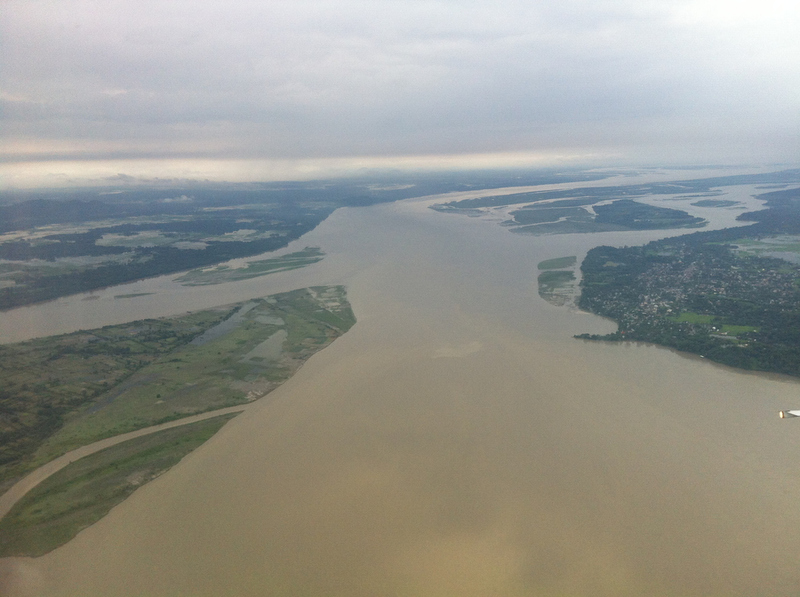 Aerial view of Brahmaputra during the July 2012 flood. The day I heard the news about the flood in Kaziranga I remembered the screening of “Wild India – Elephant Kingdom” you had at IISC Bangalore. I was wondering if you were still shooting in the same region and to my surprise it turns out you actually were. These are some amazing shots and personal fav. 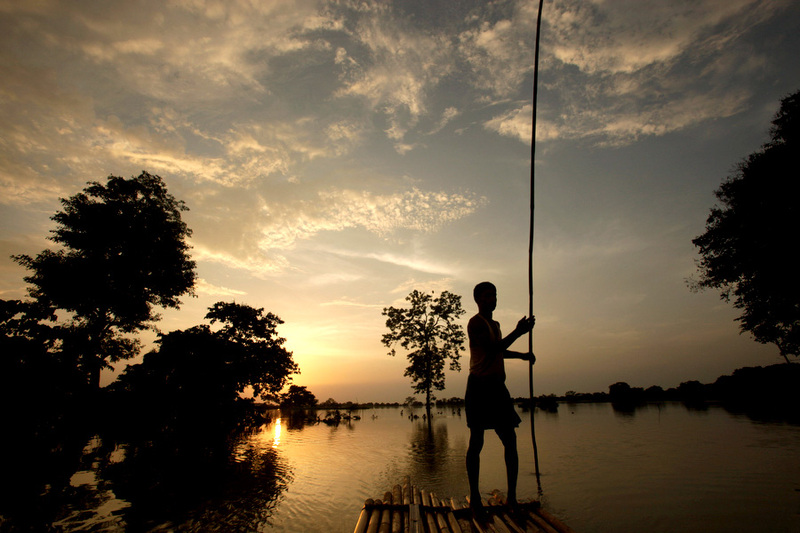 is “Boatman in the Sunset” and “Elephants crossing the road”. Thank you. Such things often go undocumented and people rarely get to see how many lives are affected… its a reality check that we are all powerless against nature..
Its painful to see the state of park which I have visited so many times..this year has been one of the worst and its continuing..Lot many animals are killed by people living on the fringes of the park for meat specially deer which stray out of the park into Karbi hills in large numbers.. It is great that you managed to document the floods of this year, and reading this in the second phase of floods, I only hope the rain stops soon. The photographs are so sad of the dead animals. 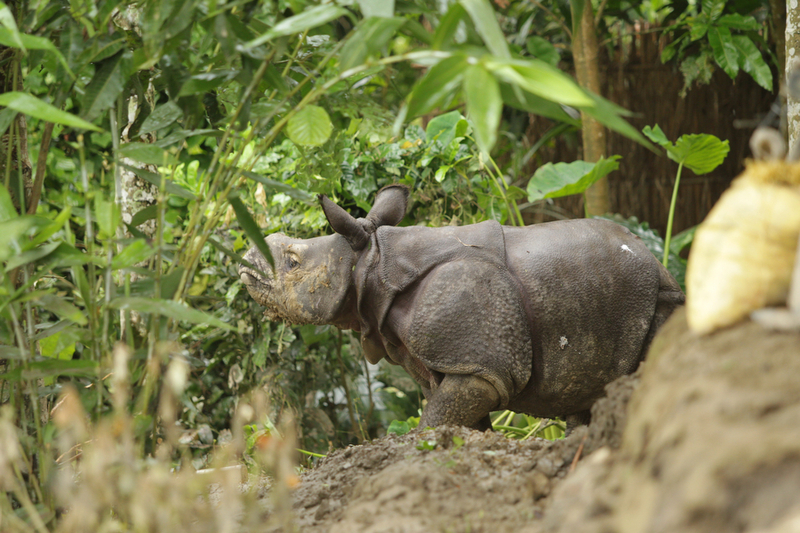 But again, as we know, the annual floods brings more life to Kaziranga and death. A reason for Kaziranga and Assam being one of the most fertile places of the world. 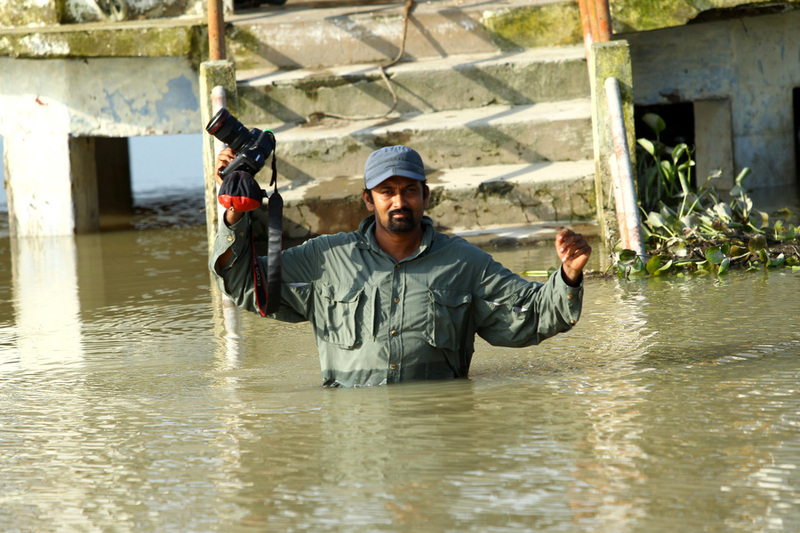 Your documentation on the Flood in Kaziranga is well represented by the photographs and it indeed speaks volumes about the magnitude of the problem. 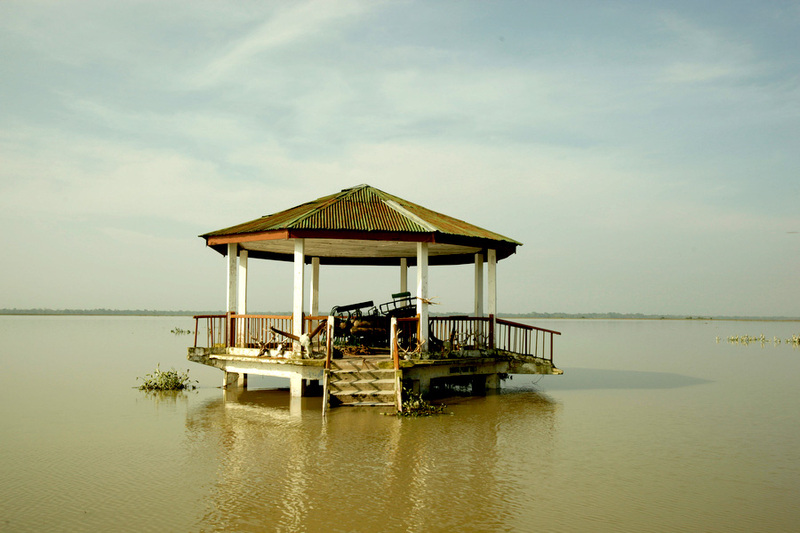 Though the flood comes every year completely submerging the Park which might seem like a natural phenomenon to happen however one cannot disagree with the fact that every year it eats away major chunks of the Park area closer to the Brahmaputra. Though Kaziranga does not have any villages inside the PA it is surrounded by more than 100 villages rendering the animals almost helpless in such times of distress when they seek refuge in higher grounds. I guess it’s time to extend the territory of the Park on the other side of the Highway towards Karbi Anlong to provide the much needed space that the wild animals need. 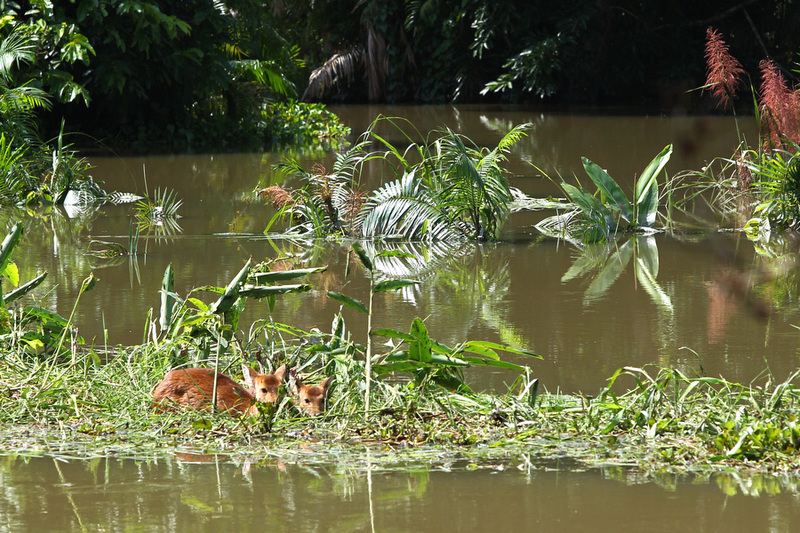 The first Phase of this years flood in Kaziranga has already taken the lives of more than 600 animals and with the second phase in progress it is difficult to imagine the number at the end of the deluge. As the floods keep on coming every year the Park will shrink every time little by little eating away precious habitats and changing the demography of the Park. Freeing hills off human habitation should be one of the mitigation measures to address the problems faced during such times as the Hills are the only shelter for the animals. Hats off to your work, driving on roads completely submerged in the water is not a joke at all especially in areas where it’s raging with force. All the very best for your future conservation related work in this part of the region. and yes protection must be extended well into Karbi. 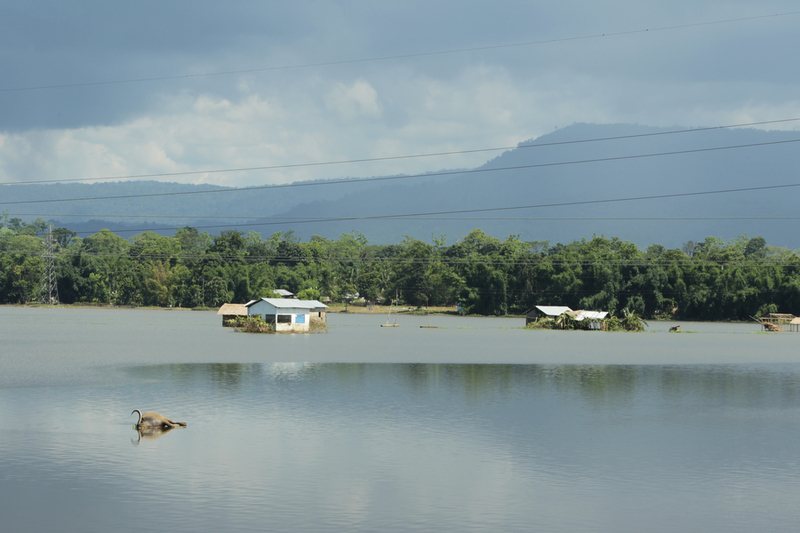 A detailed Photo essay on the floods at Kaziranga. We had seen the impact of floods in cities. You have shown it for a forest. Tks. Thanks Sandesh for this photos. From here I got a very valuable picture of ” Gangetic Leaf Fish” which I was searching for a very long time. My childhood in Perumbavoor, Kerala there was around 10 ponds and there were number of Gangetic Leaf Fish in each. It was very easy to tackle them because they will expand there mouth and take the bait faster. once they takes, there is no escape because of its expandable mouth structure. But somehome few years later, this species along with some other vanished from our place. We call this fish as “Muthi” and now only the name left. Later I came to know “Muthi” was just only a local name and I was not able to identify and find a picture of Gangetic Leaf Fish. 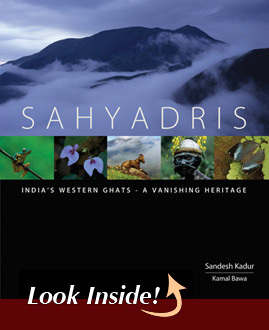 Sandesh Kadur has a passion for visual imagery and has made his mark as both a wildlife photographer and documentary filmmaker. His films have been shown on television networks including National Geographic, BBC, Discovery and Animal Planet. Currently based in India, Sandesh is documenting the Eastern Himalaya, another endangered ecosystem in critical need of conservation. 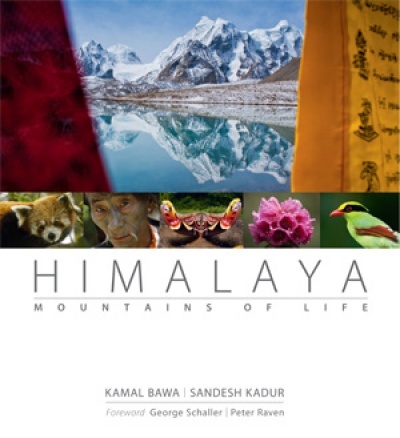 He is a member of the International League of Conservation Photographers and director of Felis Creations , a visual-arts company based in India, which focuses on creating content that inspires conservation.